Difference between revisions of "Grazing-Incidence Small-Angle X-ray Scattering (GISAXS)"
X-ray scattering is a technique that is well suited for the characterization of chain orientations. The origin of the scattering comes from the difference of the electronic cloud density of the samples. Thus large atomic number elements scatter x-rays better than smaller ones. The small q-range data collected by small angle x-ray scattering in reciprocal space corresponds to long distance in the real space. The reciprocal space is the Fourier transform of the real space and is very important in the diffraction theory to study the periodic structure. GISXAS data could be interpreted the same way as small angle x-ray scattering (SAXS) experiment. Instead of having transmission geometry as SAXS, GISAXS relied on reflection of x-ray from the samples, which enables the thin film characterization, as more sample volume could be probed. The typical experiment setup is shown in figure 1. The incident angle a is defined by the angle between the incident beam and the sample plane. The reflection of the beam results in a 2-D scattering profile with a direction perpendicular to the sample plane (qz), which is also called out-of-plane direction, and along the sample plane (q//), namely in-plane direction, in which different information could be interpreted. Figure 1. GISAXS experiment geometry. 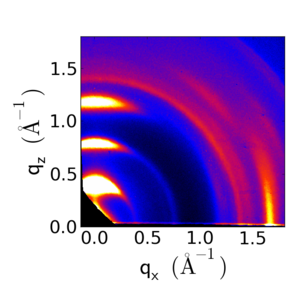 The analysis of the GISAXS scattering profile is within the framework of distorted-wave Born approximation (DWBA). This is used to account for the redistribution of the electric field intensity of the incident beam after hitting the sample surface at various heights and the re-scattering of the beam. Take poly(3-hexylthiophene) (P3HT) as an example, which would crystalize into unit cells with different chain orientations like the ones shown in figure 2. Figure 2(a) is the schematic drawing of edge-on orientation, with p-p stacking direction parallel to the substrate, whereas figure 2(b) is the face-on orientation of the polymer chains, with p-p stacking distances perpendicular to the substrate. Those different orientations resulted in very different scattering profiles like the ones shown in figure 3. For different polymers, the characterization scattering peak position is different. Here we use P3HT to get an understanding of how the chains orientation affect the scattering profile. For P3HT, there are two main characterization distances that will show up in the scattering profile: The lamellae peaks and p-p stacking peaks. Lamella is a plate-like structure with open space in between. For P3HT, the lamellae structure are consist of alkyl side chains. The side chains of P3HT make them solution processable, but they are electrically insulating. 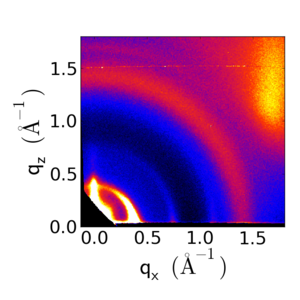 In figure 3(a), the high intensity peak at qz=~0.4 Å-1 in the out-of-plane orientation corresponds to the parallel lamellae, which has a repeating distance of ~ 1.6nm, whereas the high intensity peak at qz=~1.5 Å-1 in the in-plane orientation indicates an edge-on p-p stacking orientation, which has a repeating distance of ~0.39 nm in real space. In figure 3 (b), the lamellae peak appears in the in-plane direction and the p-p stacking peak in the out-of-plane orientation. Figure 2. P3HT crystalized into (a) edge-on and (b) face-on orientations . Figure 3. GISAXS scattering profile of P3HT film with predominantly (a) edge-on orientation and (b) face-on orientation. Grazing incident small angle x-ray scattering (GISAXS) is a technique that is based on scattering theory operated in reciprocal space. Unlike microscopy techniques, such as scanning electron microscopy (SEM), transmission electron microscopy (TEM) and atomic force microscopy (AFM), GISAXS could give results reflecting statistical averaged information of the samples. Thus, it is usually coupled with microscopy to provide information of the sample as a whole. As a non-invasive technique, it has been widely used in the area of polymer science, mainly because the polymer chain orientation on the substrate could be interpreted from the scattering profile. This information is valuable for organic electronics applications as how the chains orientate would greatly affect the charge transport within the devices. Nowadays, organic electronic devices have generated many attentions because conjugated polymers are light, flexible, economic and scalable. 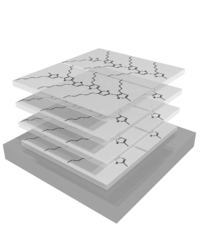 For devices like organic photovoltaics (OPVs) and organic field effect transistors (OFETs), the active layers are thin films made of conjugated polymers. The charge transport in those thin film layers are strongly affected by the morphology and chain orientations of the polymers. 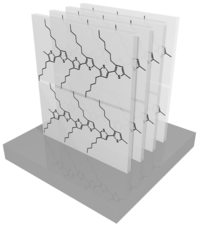 For example, due to the device geometry, the charge transport in the vertical direction is favorable for organic solar cell operations, thus, “face-on” orientation of the polymer chains is usually preferred. Whereas in organic field effect transistors, the charge transport is in the lateral direction, so the polymers are usually processed such that the chains are “edge-on” and the p-p stacking direction is pointing from one electrode to another. The orientation of the chains will be discussed later. The charge transport in a polymer chain is dependent on the delocalization of the charge carriers by alternating single and double bonds. Although the transport along the backbone of the chain is fast, they are greatly dependent on the length of the polymer chain, which is in the nanometer scale range. Beyond that range, the charge transport needs to rely on hopping or other mechanism to another chain that is much slower. Along p-p stacking direction, charges transport slower than that along the backbone. However, the polymer p-p stacking could persist much longer than the polymer chain length. This is beneficial for organic electronics applications. Thus how the chains orientate are very important in thin films. As the aromatic rings (thiophene rings in the case of P3HT) contains the p-bond, they will form attractive, non-covalent bonds. The p-p bonds are also favorable for charge transport and they usually have a characterization length in the real space. In the reciprocal space, which is the space GISAXS is probing, those p-p bonds length will show up in certain q positions if they are repeating periodically for a long distance with a large amount. *     Veaceslav Coropceanu, et al., Chem. Rev. 2007, 107, 926.